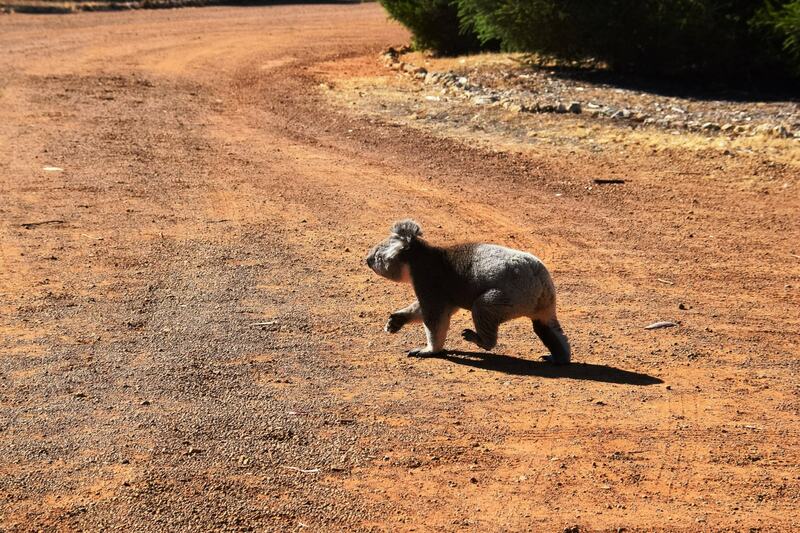 Despite what people from overseas might think, Australia is not just full of wild koalas in residential areas. 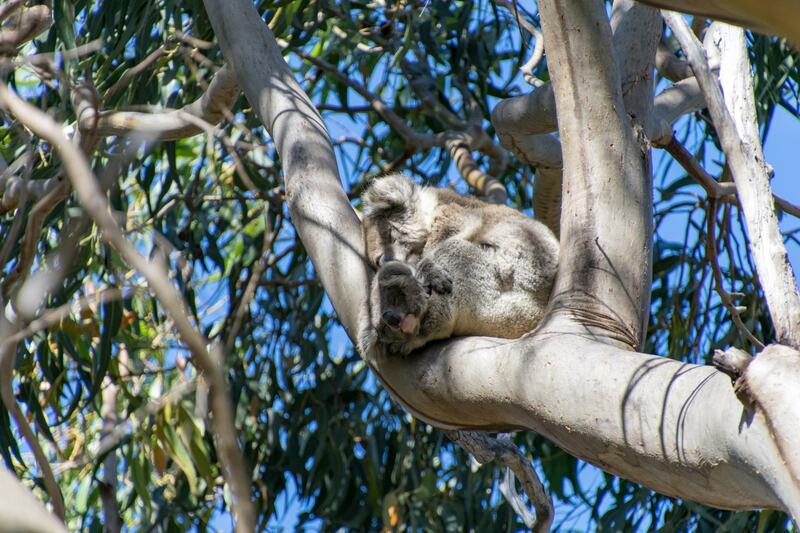 You don’t just walk down the street and spot koalas sleeping or lazily grazing on gum leaves in the trees above. In fact, it was only a few years ago that I saw my first wild koala that wasn’t in a zoo or wildlife sanctuary. 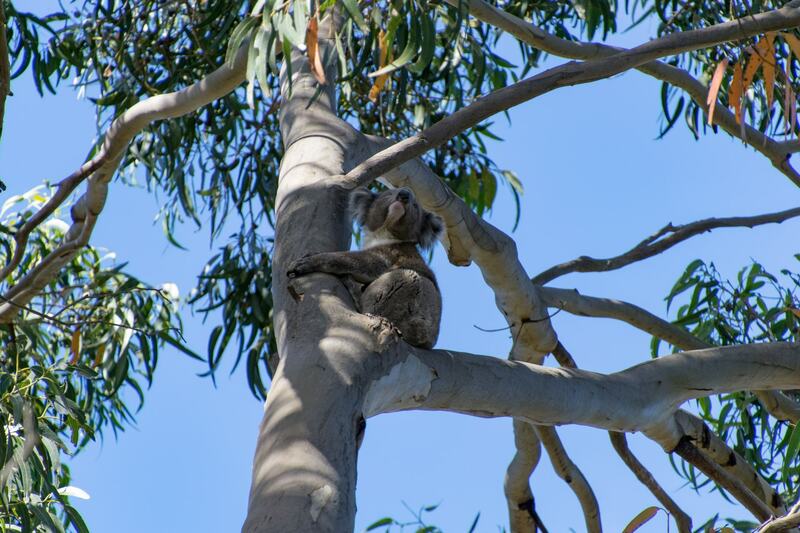 However, there are lots of placing around Australia where you can see koalas in a semi-wild setting, and one of those places is almost right at the end of Kangaroo Island. 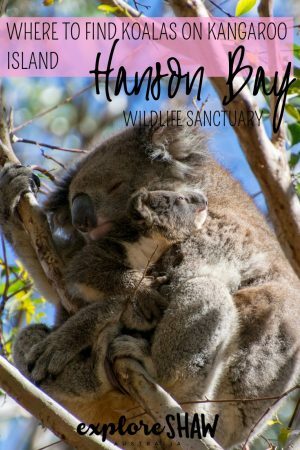 The Hanson Bay Wildlife Sanctuary is the best place on Kangaroo Island to see a big population of koalas in the wild. 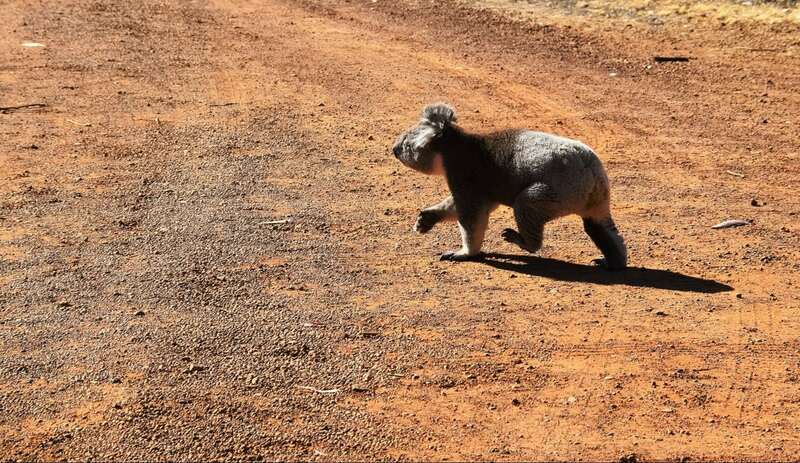 They even boast that koala sightings are guaranteed on every visit. The sanctuary is really a small cafe and visitors centre, that is surrounded by tall gum trees in which this colony of koalas have made their home. 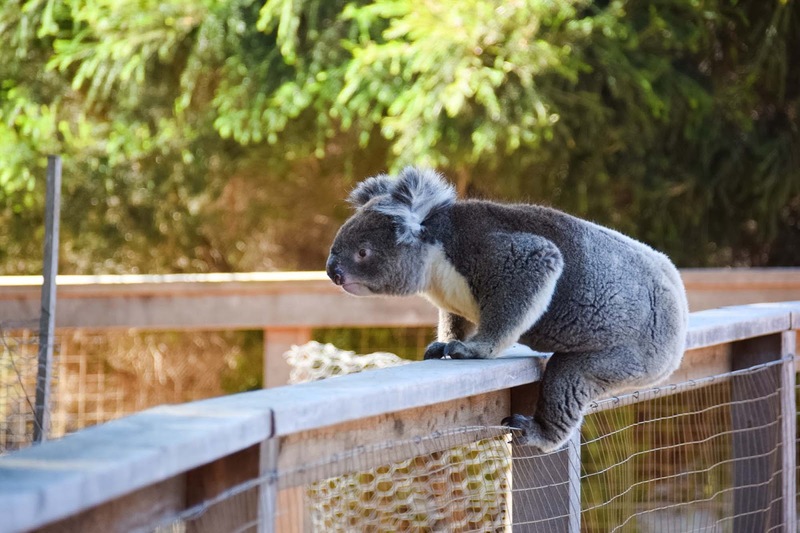 There are no cages, fences or barriers around the koalas, they are free to come and go as they please, and do whatever they normally would in the wild. 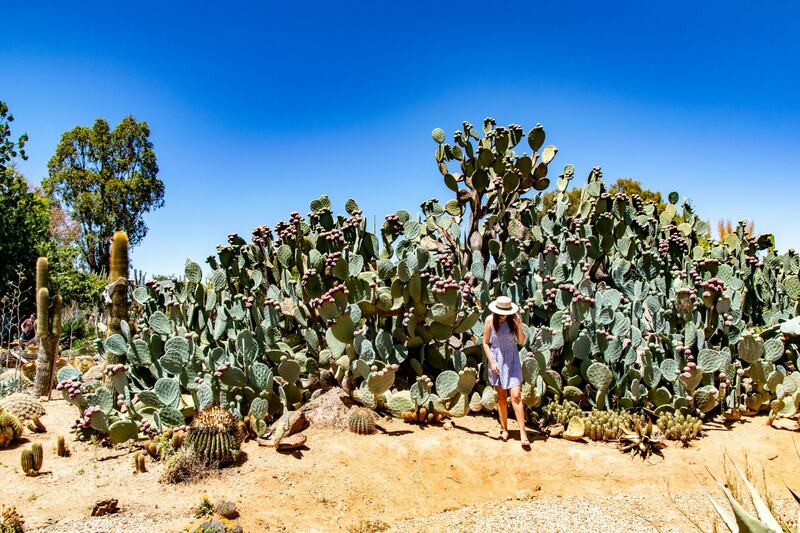 Despite being called a sanctuary, it really is like wandering into a wild colony of koalas. 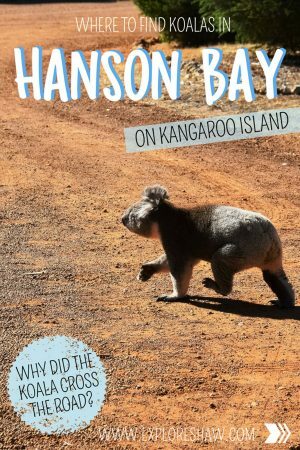 This was our second visit to Hanson Bay, after loving it so much the first time we visited Kangaroo Island. The koala area of the sanctuary is almost in two sections, right next to each other, where you can take a walk down a pathway between the gum trees and spot the koalas living above. 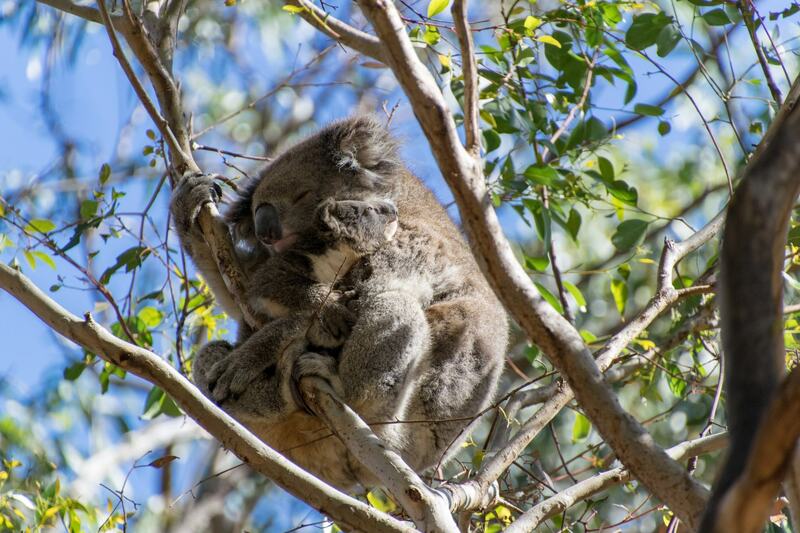 Due to the safe and protected nature of the sanctuary there are always lots of koalas in the trees. 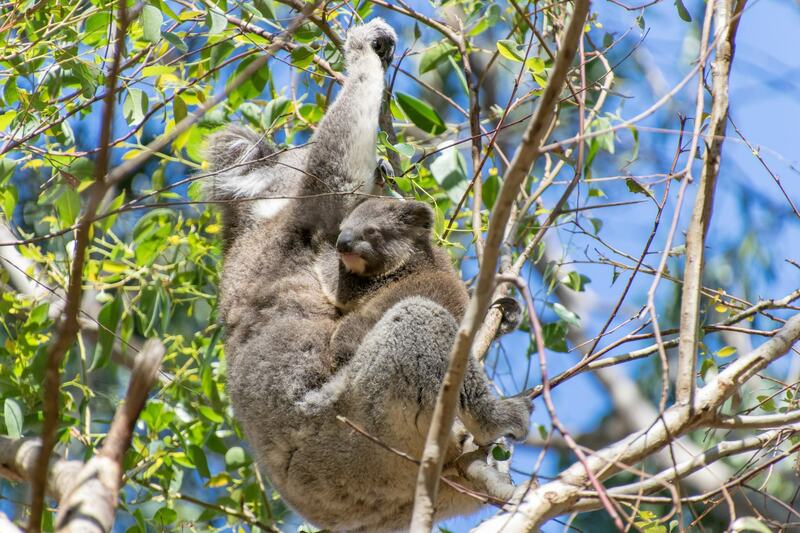 On this visit we spotted over 25 koalas, many of them holding babies and cuddling up together on the tree branches. Each morning the volunteers at the sanctuary take a walk around the grounds themselves, and place flags in front of the trees where they spot koalas. Although these guys do often move around a lot, this is a great place to start if you’re not a good koala spotter on your own yet – there’s normally still at least one koala hanging around close by where the flags have been placed. 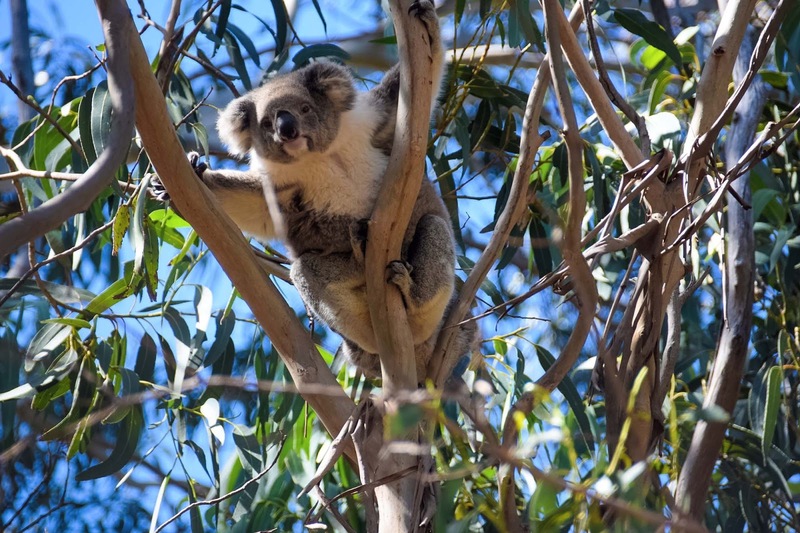 The most popular option is to take a self-guided walk around the sanctuary, where you can take your time exploring the different trails and pathways and take all the time you want checking out the koalas above. 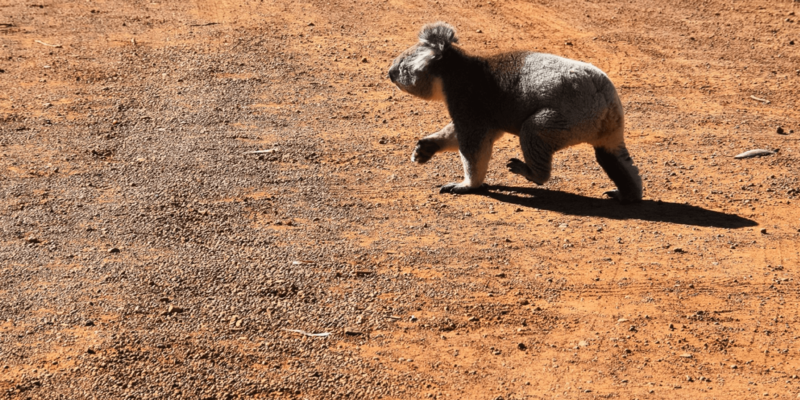 The Koala Walk is the most popular place to see koalas, but there is also the wallaby way walk that takes you a bit deeper into the sanctuary where you can often find wallabies, echidnas and possums. A self-guided tour of the sanctuary costs $10 per adult, with discounts available for children. Guided tours are also available on request, as long as you organize it in advance. 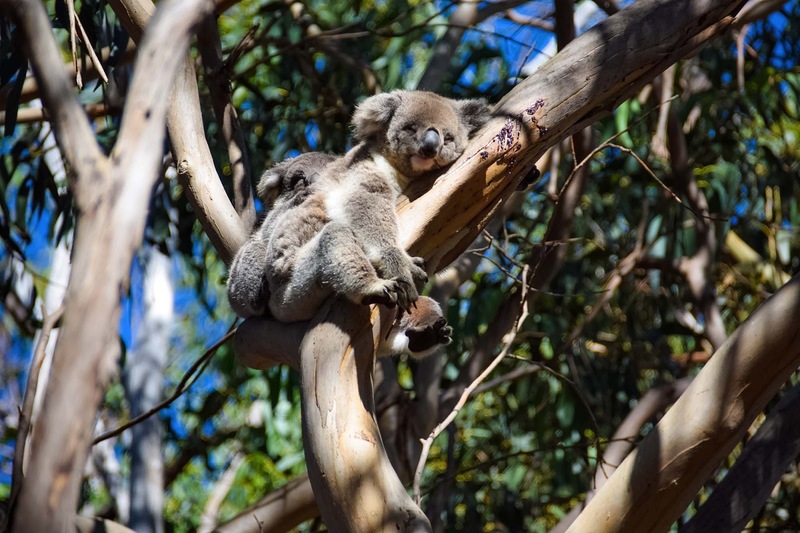 If you choose this option a local tour guide will take you on a guided walk around the Koala Walk area, which usually runs for about 45 minutes in the mid-morning or mid-afternoon. For a completely different kind of experience, take a nocturnal walk around the sanctuary, after dark when the place really comes to life. Lots of the animals on Kangaroo Island are nocturnal and once the sun goes down, that’s when the fun really starts. The nocturnal walks are fully guided and take you for a 90 minute walk around the sanctuary with one of the tour guides. They have lots of great facts and information to share about the animals that you see along the way, as well as about their habitats and environments. During these night walks you can often see koalas, tammar wallabies, kangaroos, echidnas, bats and possums, as well as beautiful views of the stars above with very little light pollution in this remote location. The nocturnal tours start at sunset and cost $40 per adult. They can be booked each night except for Christmas Day. There is also a small Visitors Information Centre and Cafe at the wildlife sanctuary, offering information about the area and wildlife you might come across, meals and snacks, gifts and souvenirs. It’s open from 8am to 6pm in spring and summer and 9am to 5pm through autumn and winter. In quite a remote location, at the end of Kangaroo Island, there are still a few options for accommodation around Hanson Bay. The sanctuary itself actually has six self-contained beach side cabins that you can stay in, only 100m from the quiet and secluded Hanson Bay. The cabins have spectacular ocean views and are located at the end of Hanson Bay Road, just down from the sanctuary. These cabins also have their own private beach track that connects with the popular KI Wilderness Trail, which takes you all the way to the Remarkable Rocks in Flinders Chase National Park, about 14km away. Guests of the cabin also receive complimentary access of the wilderness trail, as well as free entry to the sanctuary. 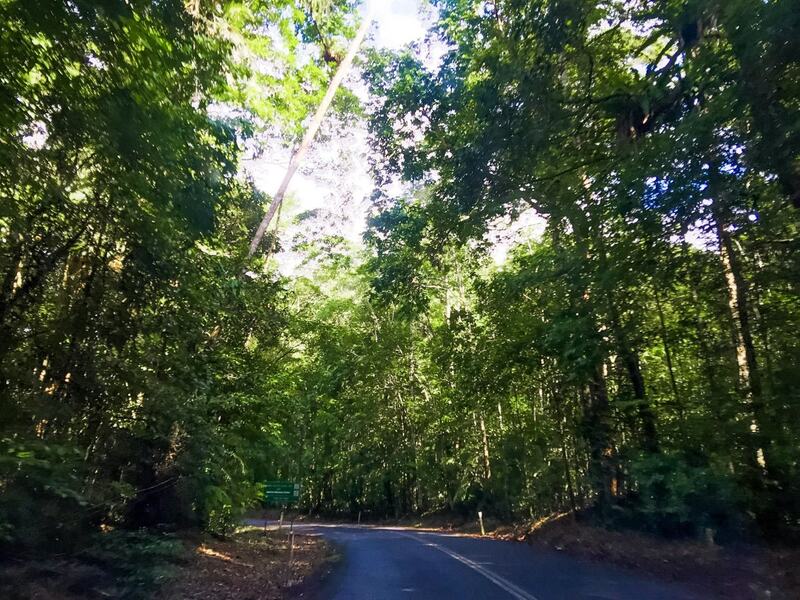 Check out the best prices to stay at the Hanson Bay Cabins or find out more on the sanctuary website here. The only other accommodation option in the area is the Western KI Caravan Park, which is one of the nicest caravan parks on the island in our opinion. We stayed here on our first visit to Kangaroo Island, but unfortunately they do not allow pets due the the abundance of wildlife around the park so we couldn’t stay there again this time. 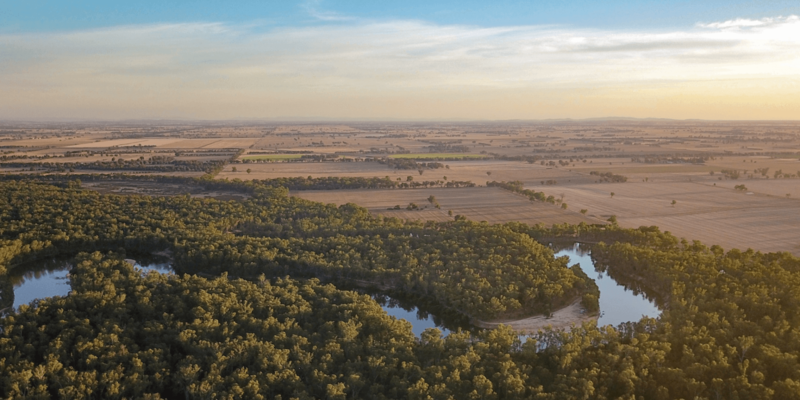 Offering self-contained cabins, as well as powered and unpowered campsites, they are also sitting along the KI Wilderness Trail, and you can often find kangaroos and wallabies hopping around the park. Their sites are lovely, grassy and large, with more than enough room to spread out and feel like you’re not camping right on top of your neighbours on the next site. Camp sites start from $30 for an unpowered site for 2 people. You can find our more about the Western KI Caravan Park on their website here. 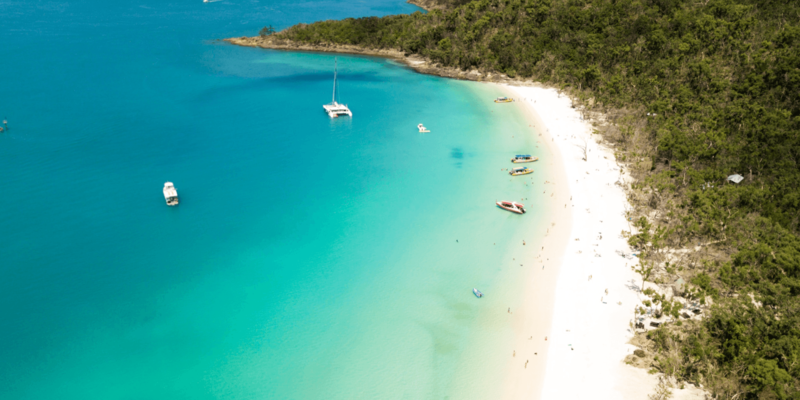 Whether you’re just coming to check out the koalas, or you’re planning to spend a couple of days in the area, Hanson Bay is a beautiful place to explore and look around. If you have time, make sure you head out to the beach as well, it’s so quiet and secluded and so few people get down that way, that it’s the perfect place for a refreshing dip. 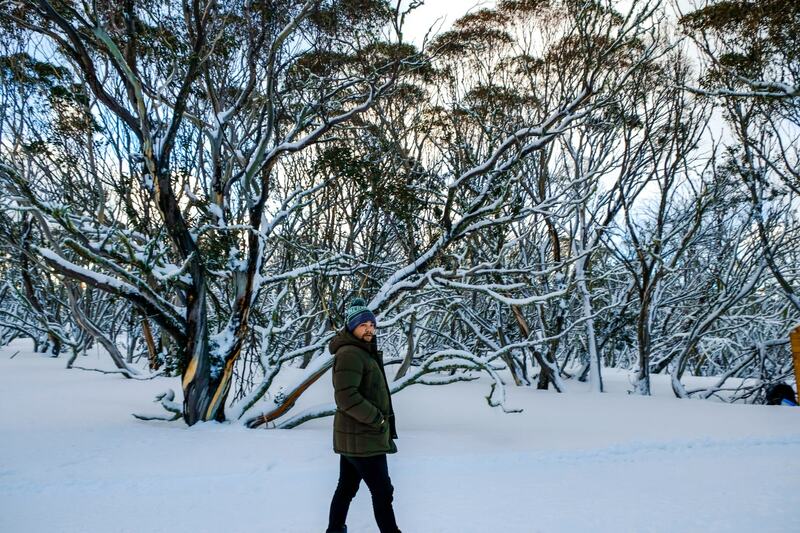 Explore more of our adventures from around Kangaroo Island.